Here it’s all about the cube, the ice cube to be precise. Because the most curious thing in this place, that made a lot of buzz, is it’s famous ice bar: A small spot, hot and trendy, but with temperatures at minus 10°C. A very icy place whose visit you only survive with 4 vodka-drinks (included in the price of and half an hour visit) and down jackets they kindly provide before you enter. The theme of the cube is omnipresent in the hotel: There is no lobby. So where do you check in? In a flashy Plexiglas cube in the courtyard. Cool. After this you will enter directly a living space with bar and restaurant. 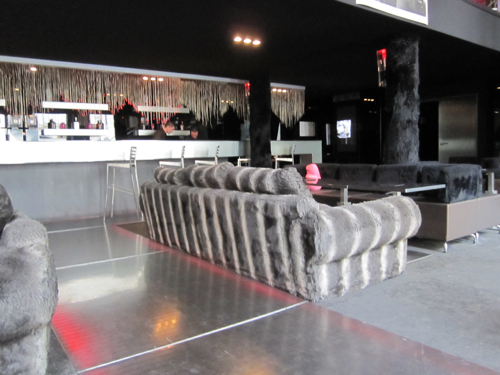 At night, this is certainly a great place: Huge faux-fur canapés, columns covered with the same material and lightening that, in the dark, looks phantastic. Are you supposed to see this place in bright daylight? Better not. It’s a bit as if you walk in a nightclub in bright sunshine and all the magic is suddenly gone because you realize how shabby it is. Do you want to have breakfast there? Not really. But you are supposed to. I got reconciled when I saw the rooms: All white, beautifully arranged in a style I would call “digital Zen”. Why? Because the room looks like an Apple-Computer. Just perfect, but not cold, more than a friend, calming down your mind after busy City walks. You’ll have your own Illy Espresso-machine (what else when you want to make the difference? ), a flat screen TV-set and, yes, a play station. They have 40 rooms and on suite (the “Nordic room”). The seize of the rooms differ from 25 to 45 square meters (270 to 590 square foot) categorized in small, medium, large and extra large. And, of course, only the size makes the difference of the price. It was a big challenge when Jerôme Foucauld opened the Kube at the end of 2005: A quite expensive design-hotel in the shabby neighbourhood of Porte de la Chapelle? Nobody believed this would work. But it does. 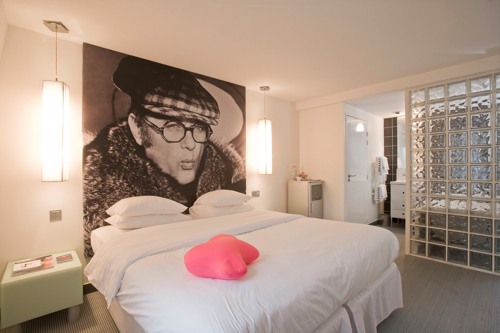 Because Foucauld rethought the concept of the design hotel. He wanted a place with a lot of animation. You probably check in here because you are young and curious and you want to enjoy partying without the hustle of looking for a cab after. It’s all here in your breakfast room: From Wednesday to Saturday every evening another DJ and on Sundays an “arty brunch” where artists not only expose, you can talk to them, discuss their work and – you guess – buy something. So even if the Kube is a little remote and situated in a colourful and multicultural neighbourhood (you more easily find an Indian restaurant than a Crêperie), it though might be your place: close to Gard du Nord, where the Eurostar arrives from London and Brussels, and it’s also on the way to Charles-de-Gaulles airport. Check in to check out. Rooms start at 250 € until 750 € with terrace and 900 € for the Nordic Room.